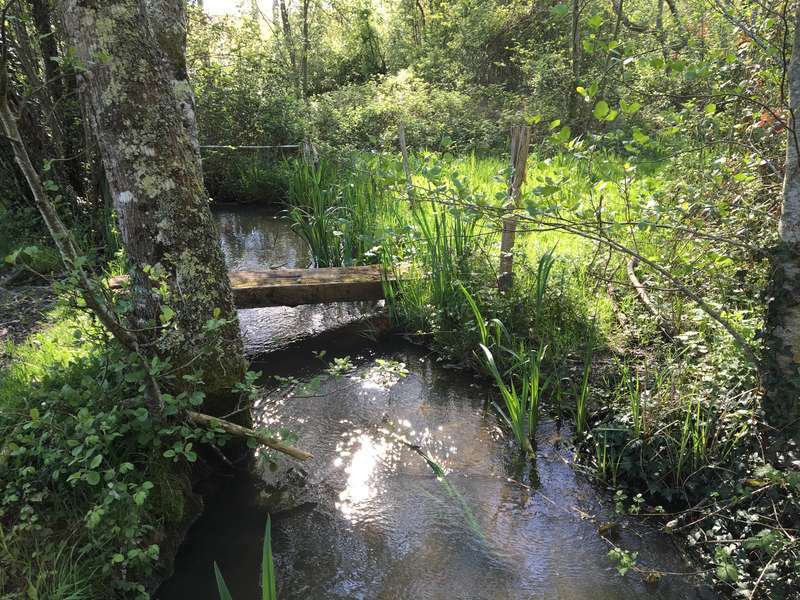 My name is Sylph, .We are in the process of renovating our 17th century mill and are creating a permaculture vegatable garden and are looking to build an irrigation system, using water from a well and stream. Our sheep look after the paddocks and we are looking to plant a forest garden. 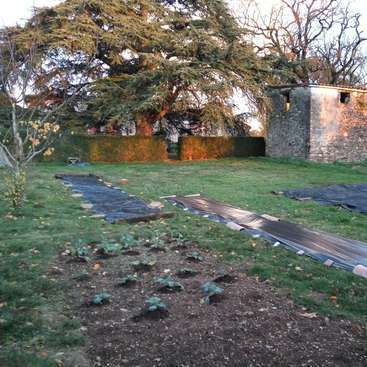 We need help in taking care of our organic vegetable garden. 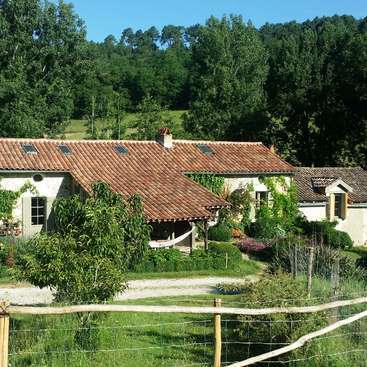 Handweeding, watering, cutting grass, feeding plants and deadheading our many roses would be some of the daily activities as well as helping with our gite in the maintenance and with hospitality with our guests when I teach on our courses. If you wish to be one of the building stones in creating and maintaining this place you are very welcome to experience our beautiful setting and make use of the studio in your own time when it is not occupied for production or me teaching courses. If you want to learn throwing on the potters wheel, you are welcome to join one of our courses. This has to be paid for as it includes, teaching, materials and firing! Our Moulin would suit someone who loves a beautiful environment, full of Art and books, and who loves being in nature. We are away from it all. It is a tranquil place, animated by bird song and many birds nesting around the house and barn, You would be part of a sustainable set up. We fire mainly with wood in winter which is locally sourced and also coppiced from our little woods. You can learn about French, German and English culture, a variety of foods and dishes. We speak , German and English here and are seeking to become fluent in the French language in due course. We have limited Wifi and internet (enough for you to check emails once a day) as we need a Satellite to connect to the outer world but there is international TV and a landline telephone. We have a good selection of DVDs and Vidos. Our place would suit a non smoker who is into the finer and quieter things in life. 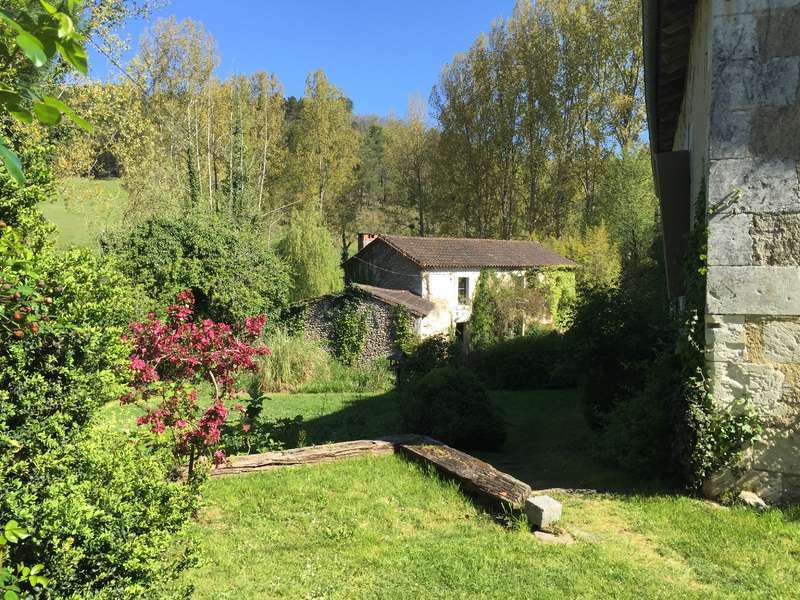 We are renovating a 17th century Mill in a remote valley in the Dordogne in the South West of France. It is a nature reserve and registered bird sanctuary. 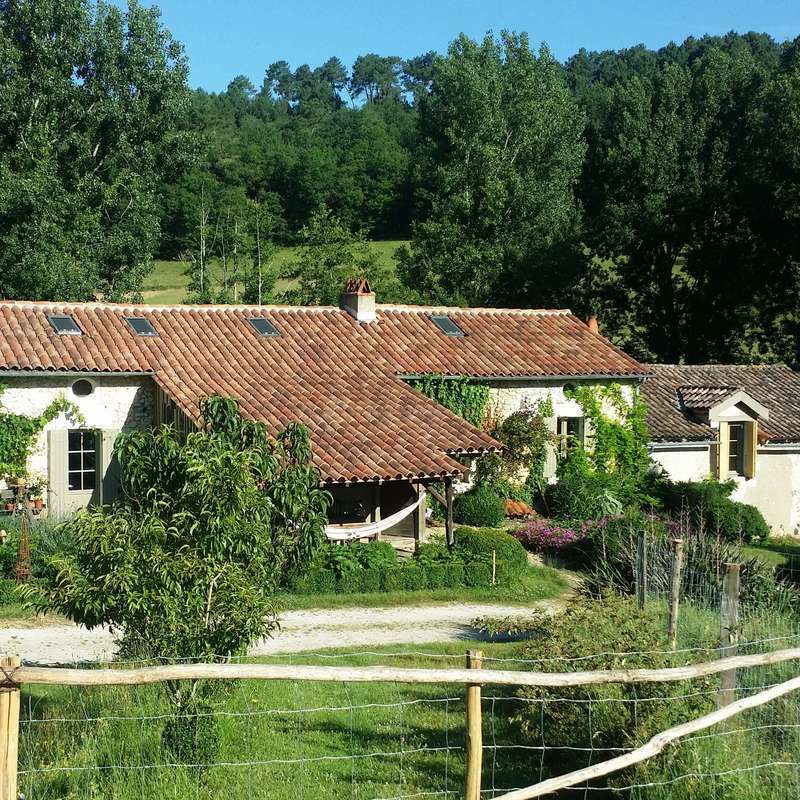 I am running Pottery and Art courses from here during the summer months, as well as letting part of the house as a gite. We have 4 acres of beautiful gardens, meadows and some woodland, which need maintenance and have 4 sheep who do some of the grass cutting for us. You could be helping with weeding and watering our organic vegetable garden or learning to prune one of the many boxes we have as well as pruning roses. Strimming and lawn mowing could be one of your tasks or any of the activities in the house from cleaning and preparing food to painting and decorating, child minding or learning to preserve food and making jams. 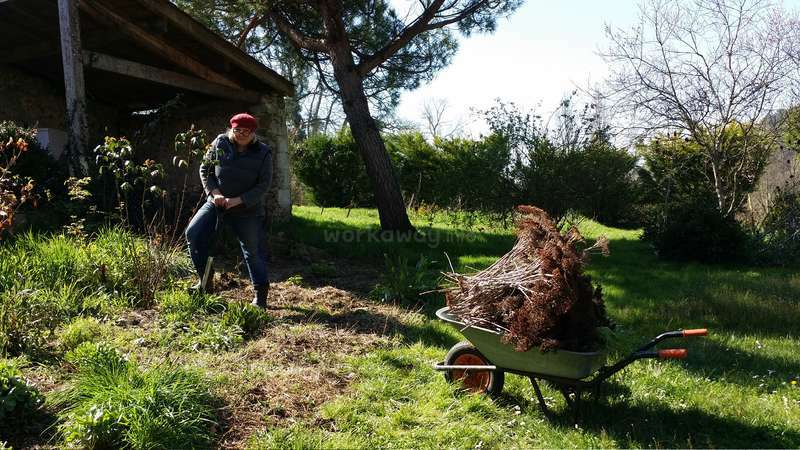 If you are a more skilled individual we would love to welcome people who have gardening experience and are interested in an ecological way of renovating, water conservation and woodland management. Computer and facebook, twitter skills are also useful in building a network for us with our little haven and promoting our business. French speakers are very welcome and could help with us learning the french language. We have accommodation in the Grenier, the roof of the Moulin. It is depending on occupancy in the house, either a white twin room with desk, chair and comfy bed or another Grenier - Attic room with a small double tempura bed and a large desk and office chair. A modern bath/ shower room is underneath. Hot water comes from a solar hot water system and we will provide you with organic shampoo and soap as our system can only tolerate biodegradable products. We live a 10 minute drive away from the next small town and train station and can offer you lifts and pick up from there should you wish to branch out. Bergerac and Perigueaux are 30 minutes away by train and Bordeaux 1 hour. We have bicycles for your to get about with. 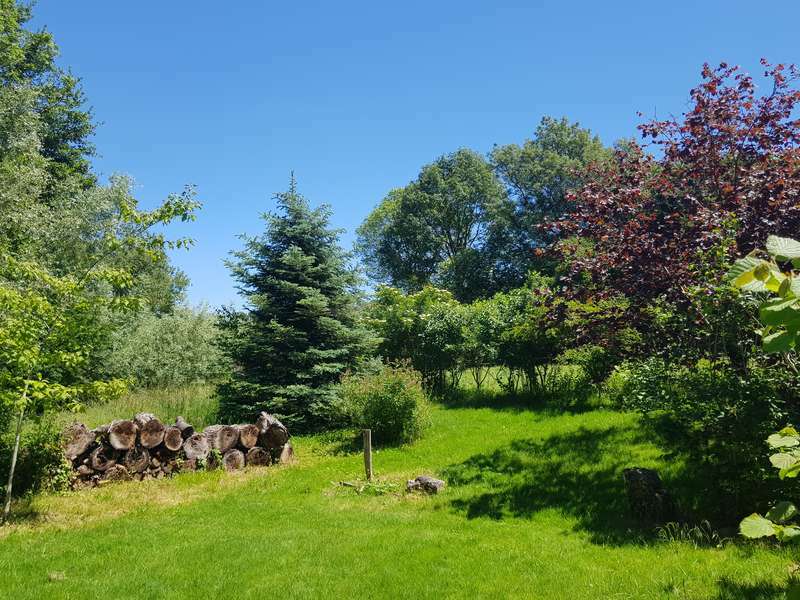 If you are self contained and motivated and are able to occupy your own time as well as being part of a family set up and enjoy the outdoors, then the Moulin is for you. All meals will be prepared together and we require someone who is able to eat most things, as we have a varied healthy diet which includes meat. 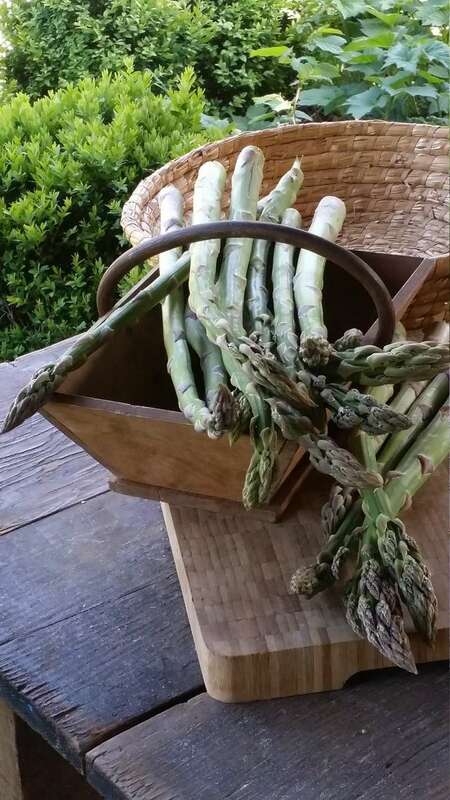 Some of our vegetables come from our organic vegetable garden. This is a non smoking place and we ask visitors to respect this requirement. You will have full use of the library as well as barn should you wish to paint or the woodlands for meditation. 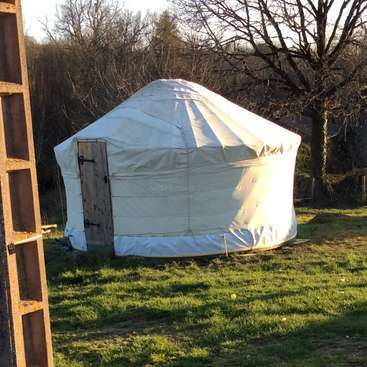 This place would suit someone who is into art, writing, nature conservation and permaculture and is generally active and motivated and has a positive outlook on life. Great at doing laundry and even looked after my daughter when I was away for a few days on business. I could completely rely on her and trust her. She was very self sufficient, conscientious and not scared to unblock a drain or fix something. She is also very skilled at helping with the internet, researching and helping with designing posters. A natural with animals, our pets were much loved and the sheep had her keeping an eye on them. Lucas was a god send this summer. He came just at the right time and was a perfect member of our family for two months. The salads he made were legendary and works of art and I got a taste of the finer things in life and that all the effort to attain them is well worth it and part of ones self-expression and contribution to caring for oneself and… read more the planet. I so appreciated his input and advice and easy going joyful manner. He took on many tasks and was always reliable, courteous, and was a very good balance of integrating but also keeping himself busy with his own pursuits and making good use of our place to further his own journey. His integrity is impeccable and he is a fast learner. Capable of taking on responsibility . It was wonderful for me to delegate all the watering duties and he did a lot in the vegetable garden, learning new skills. My heart goes out to a wonderful young man, who will contribute much to our planet being taken care of. Thank you Lucas for your shining light! I had an amazing time with Sylph, Chelsea, Samy, Otto, Lilly, all the guests and students and animals in this place called Le Moulin de Leymonie. This was my first experience on Workaway and I cannot express here all my gratitude to the universe for bringing all of you into my life! From the very first moment when I talked to Sylph over the… read more phone, I had the feeling this would be life changing for me. One of my main purposes was to be more connected to nature and myself and stop rationalizing so much by doing some physical work... and my experience gave me that and so much more! The working hours were as agreed and Sylph showed a lot of flexibility leaving me free to go on my own rhythm and enjoy what I was doing. She was patient while teaching me the skills she considered necessary to work on the garden and also listened to the advise I gave her on her business. Thanks to her and Carole I could learn a bit about permaculture and sustainability and be more aware of the impact I have on this planet. Sylph is an inspiring soul. She's a strong and talented artist that taught me everything rewarding in life comes with a lot of effort. I really appreciated every conversation we had over tea or coffee and every experience she shared with me. I feel so inspired by the motivation she finds to make Le Moulin a creative place for people of different backgrounds and also her resilience, seeing every new challenge as an opportunity to go further. Thanks to my time at Le Moulin I could start a new life in Valencia with a fresh mind and more aware of my mission on this planet, as an artist and a soul in constant growth. 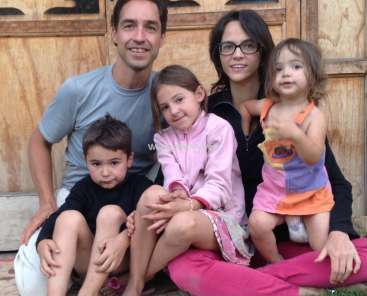 If you’re thinking of embracing the countryside experience in France, I strongly recommend you to spend a time with this family. Go with an open mind; dig that ground down deeper and feel connected to the energy this place can offer you. I hope you feel it. I still do deep in my heart. Thank you, Sylph and Chelsea! It was a great experience! Thank you for your hospitality, for the opportunity to explore France, to visit all these festivals and to see the french countryside! The surroundings were incredible, the food was delicious and the working in your marvelous garden was a pleasure! It was a pleasure to hava Alisa come and stay and help to tackle the box caterpillar in our garden. I would most happily recommend her to join another team. Alisa was very helpful and I wish her all the best on her travels. Jenny and Josh were with us for a month during winter. Despite the constant rain and cold weather, we had a wonderful time together. The main job in winter is to keep warm and catching up with indoor jobs. This meant fetching wood in, cleaning out stoves and keeping fires going. Jenn and Josh were very adaptable and instrumental in getting… read more beautiful carpentry work finsihed for puttin up curtain rails and installing an electric fence. They also house and pet sat our animals, while we went for a weeks holiday. There were 9 sheep to take care of and a vegetable garden which needed weeding. Everything was done with such care and attention to detail. We had such fun. They are totally reliable and trustworthy, hard working, motivated and a positive young couple. I would love them to come back to carry on with our outdoor projects another time, when the sun is out here. We miss them and their smiles and giggles very much. Best wishes on your journey and all that you endevour to do. Sylph and he daughter were excellent hosts. The place is stunning and the work was pleasant. I had a marvelous Workaway experience and would recommend this place to everyone. Sylph was a very welcoming and generous host. My experience with Sylph and her fun and energetic daughter, Chelsea, in April 2017 was one I will never forget. I must say that I have never been so well fed in my life! Sylph is a great cook and baker and has many traditional recipes to share with those who are interested. 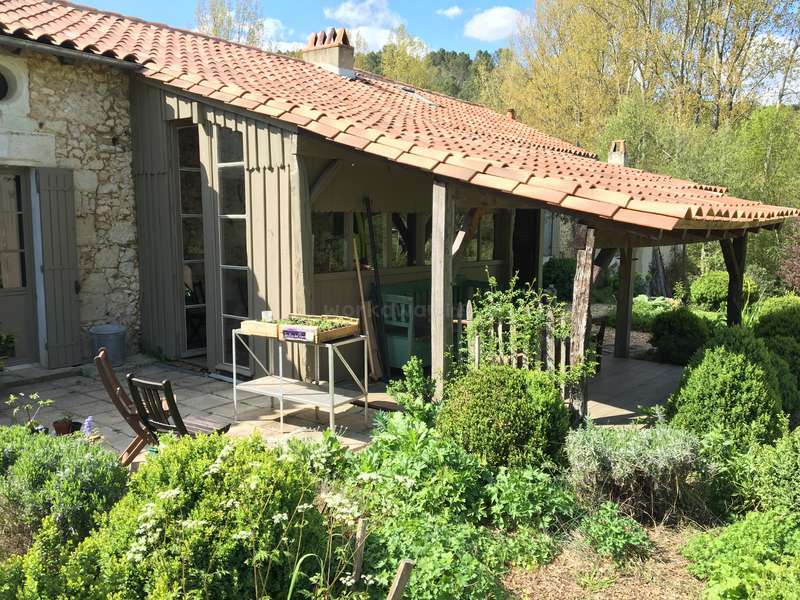 I really enjoyed being… read more there for her ceramics workshop where I provided some cooking and cleaning support while the lovely guests expanded their pottery skills and enjoyed some downtime in the gite. The house and property themselves are so gorgeous and the surrounding area is incredibly peaceful. Going for walks or spending time outside, whether you are working or relaxing, guarantees you will feel a sense of peace and serenity. 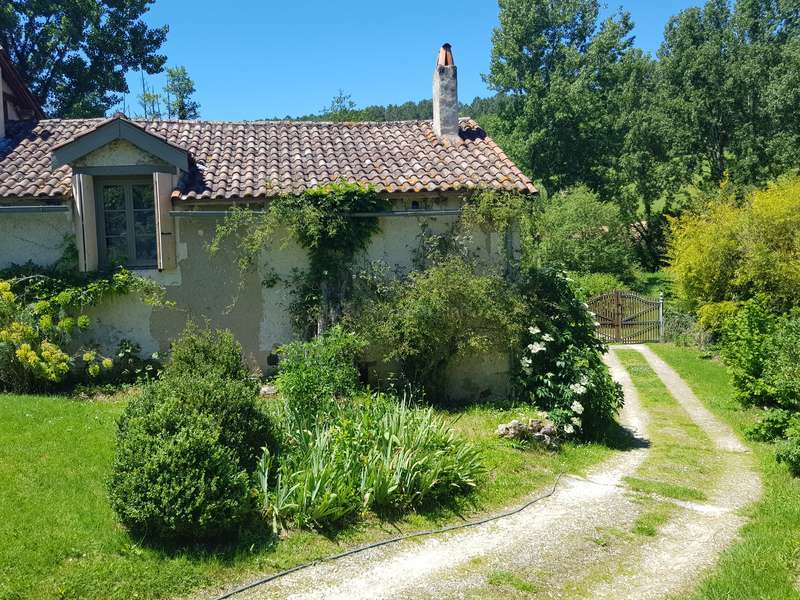 I also had the opportunity to help Sylph with a number of tasks, including some gardening, cooking, and a bit of writing to advertise her gite. Sylph and Chelsea welcomed me into their home as one of their own and I will always be grateful for their genuineness and kindness. Miss you guys! I hope to see you both again. (P.S. Chelsea, I still have your drawing with me all the time. I keep it in my laptop case so it stays nice and flat). I had an amazing time with Sylph and her daughter Chelsea. So much so that I ended up staying for two months! I was made to feel completely welcome from day one, and was asked to treat the house and land like my home. Sylph is huge hearted, generous and full of life and laughter. Oh and she’s a fantastic cook, so trust me you will never ever… read more go hungry! 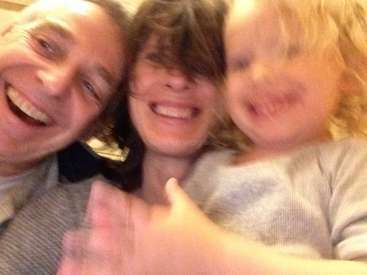 I arrived a stranger and left as part of the family - I have a feeling that will be the case for most Workaway people. The work I did was hugely varied as it's a very old house that needs most kinds of work doing to it. I was always encouraged to match the work I was doing with energy levels on that day so working hours were always flexible. I particularly enjoyed working outside on the land, gardening and woodland management, but also did decorating, cleaning, childminding and cooking. We had some great days out exploring lovely historical towns with local markets and all the amazing things that the Bordeaux region has to offer. I could go on and on about how fantastic Sylph as a person but I’m keeping this to what I think other Workaway people will want to know. Basically I would absolutely recommend Sylph’s and her home to anyone. Great accommodation, company, food and belly laughs. Miss you loads! Denise has been such an incredible positive contribution to our lives and this place that I can not express my gratitude enough in words. There are people who live and there are people who illuminate everything they touch, meet and do and Denise is one of those rare souls who make everything shine and grow just by being. Her energy glows and… read more lingers here and we are so looking forward to her returning to the Moulin and us. She has been a keystone in creating and setting the grid for all the wonderful things which this place is and is going to expand into. A most magical, meaningful, productive and fruitful exchange. 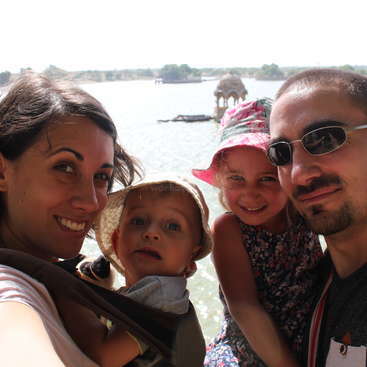 A really good first workaway experience for us. Thank you for letting us look after your place, it has inspired us a lot on our journey. Sylph and Chelsea are great company, very welcoming and full of energy. If we drive north again we would love to come and visit! Best of luck with your project!